This is by seven months the first American Direct-to-video animated film, and this started Disney using Disney Toons, the makers of their cartoon shows to make sequels to their popular films. This is an important film in animated history, but it is also mostly forgotten. This was made to be the pilot direct-to-television pilot for the animated series, and I for years thought the film was a movie adaptation of the show and the makers turned my favorite character, Iago, into a villain. In some odd production issues Robin Williams was lied to about merchandising so he refused to come back, and he was replaced by Dan Castellaneta. To what I can tell liking this movie is primarily based around thoughts on Iago. Iago was my favorite character of the series due to him having flaws, So I am basically this film’s target audience, but I know many fans hate his voice, so they should not even bother with this film then. It starts with a few thieves, as they play the demo version of “Arabian Knights.” They then look at all of their loot and their useless leader, Abis Mal. He proceeds to claim 99.99% of the treasure for himself, break another 0.001%, and give his many henchmen a few pennies. How is he their leader? The Disney DTV movies normally try for a more serious story than the Universal ones, but with unbelievable things like this it does not work. Aladdin then robs all of their robbed goods by literally beating armed men by running on their heards where only Abis Mal even slows him down, and this is a major problem that also happened in The Lion King II, the villains are early on showed as so easy to effortlessly beat it is unbelievable when they are threats later on. At least these guys do not have important roles here. Aladdin and Abu then proceed to give the stolen items to their rightful owners… They just throw it at people on the ground. I have mixed feelings about this. For one they are giving it to the poor, but since they are all in the same area this could really damage the gold standard there, and some big heavy gold pieces are bound to hit some elders and children on the head, and he keeps the most expensive thing as a gift for Jasmine. In the meantime Iago digs himself and Jafar out of the ground, and I think this addresses a problem from the first movie. Nobody else has ever told me this issue, but just throwing Genie Jafar’s new lamp in the desert sounded like a horrible idea to me, since someone will find it sooner or later. Well Iago refuses to release Jafar not trusting him as a Genie and blaming him for their problems by going too ambitious. Iago sings “I’m Looking out for Me,” while throwing Jafar’s lamp down the well. Personaly I like Gilbert Gottfried’s voice so I am okay with the song. It ends with a merchant beating him making it ultimately pointless. Aladdin and Abu go to lord their new power over “the common folk,” yet they foolishly bring no weapons. Iago decides he is his new key to power by pretending that he was under Jafar’s mind control, and of course Aladdin tries to kill him until they run into Abis Mal’s gang. Fairly humorously Abis Mal’s gang has to remind him he is Aladdin, and all of the suddenly they are threats now, and Iago while saving himself from Abis Mal saves Aladdin as a side effect. Aladdin then in gratitude offers him a fair hearing. To me that is a paid debt if he then lets Iago leave Agrabah, but Aladdin is too much of a pushover who tries to get Iago back into the palace permanently. We then get to some boring Aesop amnesia where Aladin forgets not to lie, and Genie comes back to sing “Nothing in the World,” a useless song we can skip. Word of advice, if you know the basic plot the first twenty minutes, and one second can be skipped. Abis Mal’s men decide to kill him, but not after he finds and releases Genie Jafar who scares away the men. Abis Mal and Iago have been carrying the film, so obviously Abis Mal decided to bring in some help for the movie’s sake, what a hero. When Jafar tries to flee he is forced to stay, as that is how the genie code works, which includes he cannot kill. Jafar quickly nearl kills Abis Mal wasting two wishes, as part of his new simple plan, get Abis Mal to let him torture Aladdin, then give him twenty wishes worth of objects if the third wish is for his freedom. Jafar is very calculating in this film, and I love watching it. “It is not enough that we simply destroy Aladdin… they’re are things so much worse than death.” This part is great. Jafar turns his weakness of not being able to kill into a strength by deciding to use torture instead, and he goes all out on it. At the dinner meeting Sultan offers to make Aladdin Jafar’s official replacement, but they quickly start talking about Iago and their hatred of him instead, and thanks to Abu’s attempts to kill Iago, he ends up right there, where Aladdin has to stop him from being executed on the spot. He is apparently awful with words, as he just says there might be some good in Iago without even saying that the parrot saved his life, and now Jasmine and Sultan are mad at him. However Iago realizes Aladdin, unlike Jafar, did something selfless for him. To help Aladdin and Jasmine make up he uses reverse psychology on Jasmine to forget about his charm, and he also gets Genie to give them some private time. The problem is it only uses superficial love tropes like looks, but it at least explains Iago being useful. Jafar then decides treacherous Iago joins whoever is in power, so he decides Iago will just flip back to him out of fear, which is overall what happens. It also becomes apparent that between working with incompetent Abis Mal and Iago’s treachery Jafar has lost any faith in loyal, good help. Jafar’s plan is great, kidnap everyone Aladdin cares about and get him sentenced to be executed. First Iago suggests to Aladdin to go on a one on one trip with Sultan to a perfect place Iago knows of, which Iago gets Aladdin to do. 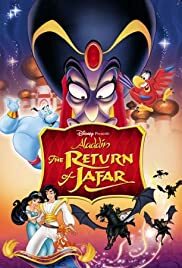 With Aladdin, Sultan, and carpet gone Jafar beats Genie with the villain song “You’re only Second Rate,” as apparently Genie has no power compared to Jafar, and it ends with Genie being stuck in a crystal ball, and Abu bing chained. One common problem of the TV show was finding a way to limit Genie’s power, but here they just had someone more powerful, and his villain song is really good. While Aladdin is explaining to Sultan about Iago much better this time Abis Mal shows up, and the animation gets a serious boost, as a diferent company starts doing it. Iago is quickly blamed by Aladin and Sultan is kidnapped. Aladdin and Carpet go to save him, but carpet is captured as well, and Aladin is heading towards a waterfall. He is saved by Jafar (in disguise). Some viewers are bothered by Jafar saving the hero, but remember, his plan is to torture him, and this is too fast. Aladdin then gets home only for Princess Jasmine to order his execution for assassinating the Sultan. It is then revealed it was actually Jafar in disguise, and Jasmine is also captured. The way Jafar then thanks Iago makes it even more obvious he will switch back later, but I soon realized he is torturing Sultan and Jasmine by reminding them that they trusted Iago, whom betrayed them previously. A further detail I like is when Aladdin explains himself to the guards instead of questioning the existence of magic like lesser fantasies do they question him surviving going down the waterfall and why the evil magic user would save him. After Jafar leaves Iago works on freeing Genie, and Jafar makes a great torture mistake. Aladdin thought his own girlfriend was having him executed, but Jafar reveals himself to Aladdin ruining a few details, but Iago frees Genie, who then frees all the good guys. Iago’s new plan is to flee from Jafar and change identities, but everyone else wants to save Agrabah. Genie reveals that destroying the lamp will kill Jafar unless he is freed. Iago flees away, as everyone else goes to kill Jafar. At the climax Genie Jafar offers hordes of rewards to Abis Mal if his third wish is Jafar’s freedom, and it is about to work except Abis Mal keeps asking for more and wonders if he has a guarantee everything will stay. I like this because the villain fails because of his own flaws, greed. Jafar then notices Aladdin and the battle goes outside with the lamp stuck between them. Jasmine for the only time in the movie does something useful by trying to grab the lamp, but Jafar creates a lava pit. Then Aladdin mocks Jafar for being unable to remove a street rat, so Jafar tries to squeeze the life out of him. It turns out it was Genie in disguise, and real Aladdin and carpet are going for the lamp. I presume Genie cannot kill the lamp due to the rules. Well Carpet dies for the second time in two movies. With Aladdin stuck in the lava pit Iago comes to do a deus ex bird and grab the lamp, but before he can hand it to Aladdin he is struck by Jafar’s lightning. Jafar gives an evil laugh not realizing Iago has enough life left in him to kick the lamp into the lava. Iago is seemingly dead but he then says the move’s arc words for the third time. “you’d be amazed what you could live through.” With Jafar defeated events are set up for the TV series. This film starts with a slow pace and then it gets quick, its heroes are bland, and it has animation problems. On the positive side it has a great villains, stars someone struggling with his own morality, stars Iago, and I enjoy the action in the second half. The major divide is Iago. some fans hate him and others, like me, view him as the best part of the franchise. It is not the movie for everyone, but I consider it to be worth a watch.